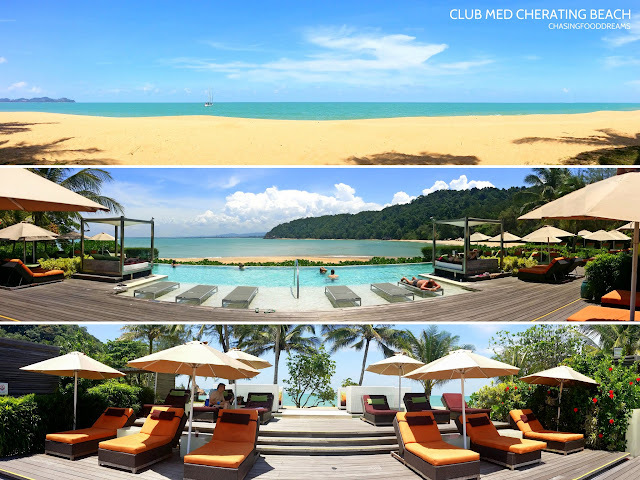 You’ve read about the place and its beauty, now let’s find out what you can do at Club Med Cherating Beach! Continuing from my stay at Club Med Cherating Beach at Kuantan, Pahang, there’s basically loads to do or simply do nothing at all and enjoy the stay. 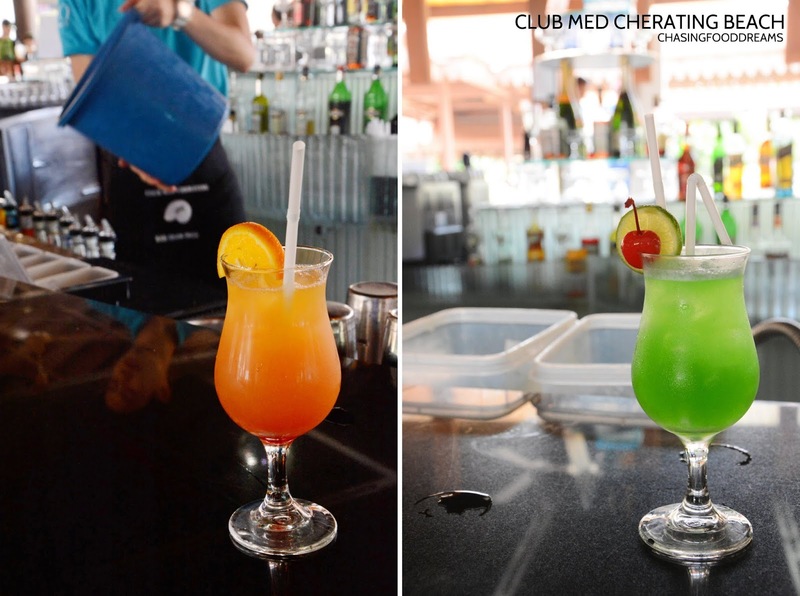 Our first day at Club Med was more easy-going as we took a stroll around the hotel to check out everything. 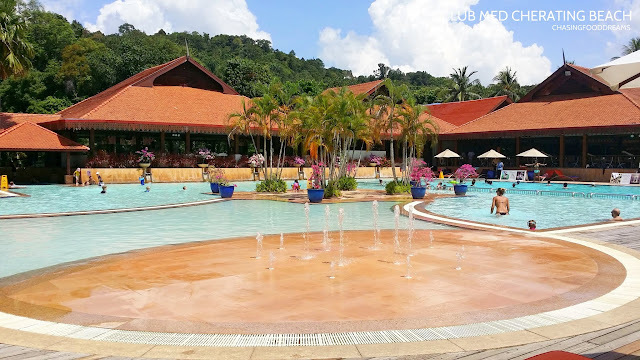 In the evening, we hit the regular swimming pool because my little one just couldn’t wait to have some water fun when he saw the pool. The general swimming pool at the club is beautiful and is cleverly segregated into different sections. There is a children’s corner as well as the regular adult height pool. Lots of deck chairs and parasols surrounds the pool in every possible corner. Since we were there during non-peak season, we enjoyed the pool in bliss. · Dine and Wine – enjoy and feast on endless spread of cuisines at The Mutiara, The Rembulan and Noodle Bar throughout the day. It’s literally Eat till You Drop! 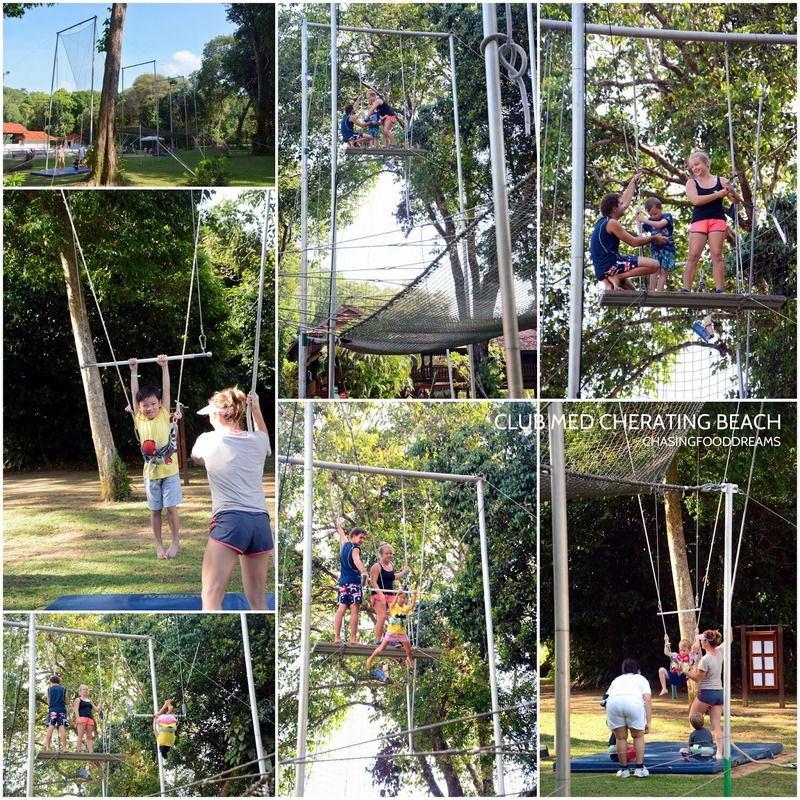 · Sports and Activities – Jungle Walk, Forest Adventure, Rock Climbing, AquaFitness, Archery, Flying Trapeze, Sailing, Kayaking, Swimming, Tennis, Squash, Table Tennis, Badminton, Beach Volleyball, Basketball, Football and more. 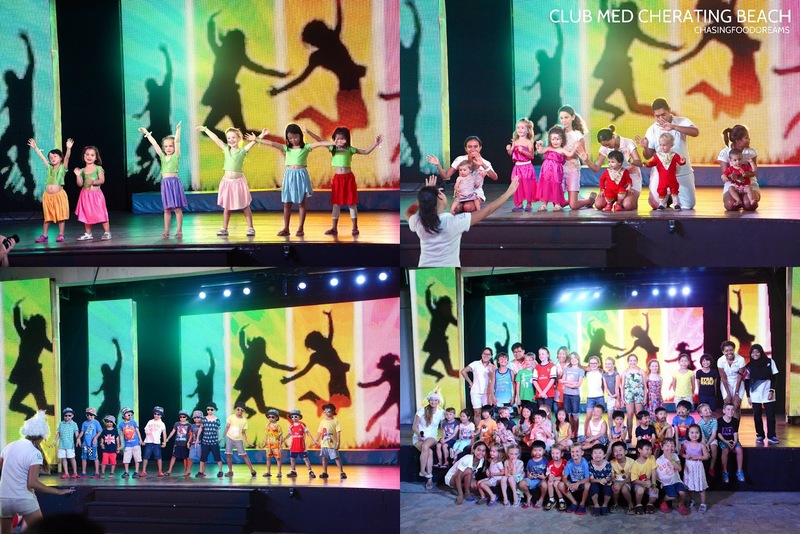 · For Children & Teens – Baby Club Med® (4 to 23 Months), Petit Club Med® (2 to 3 years old), Mini Club Med® (4 to 10 years old) and Club Med Password® (11 to 17 years old). Join the various activities for the different categories to keep the busy while the adults have their own time. 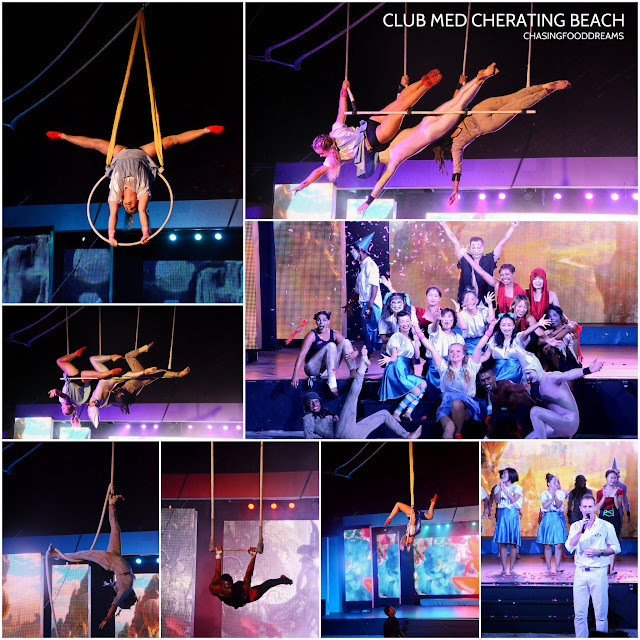 · Night Entertainment by G.Os – featuring different themed performances each night. There is also a Saturday party night with fireworks! The next day, my little one joined the Mini Club Med® which starts as early as 9am and finishes at 5pm in the evening. My little one is kept super busy throughout the day with the G.Os together with other kids. At the club, all the kids are fed and bathe in between their activities so the parents do not even have to worry about them. Our first station for the Mini Club Med® on that Saturday was Flying Trapeze Little Circus. At first he was really hesitant about it but once D tried it, he was having so much fun! I felt at ease immediately once I saw how the G.Os managed the kids and how they managed to put every child at ease and was soon laughing and having lots of fun. We left D in good hands and took a nice stroll around the garden to enjoy the morning hours of the breeze. Nearby the area was the Archery station. I didn’t try the archery as the timing wasn’t suitable as I had plans for other activities. We lounged by the pool for a bit as I did some reading while the other half went for a swim. Then we saw see the kids have some fun time at the pool after their trapeze session and a quick shower. After showering off, the kids had their lunch with the G.Os. 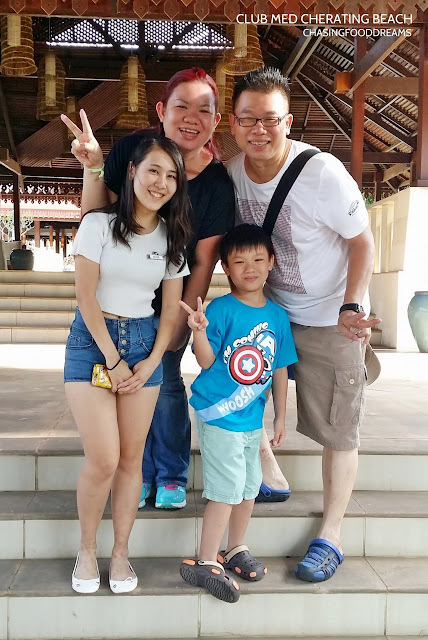 We had our lunch and then decided to work off the lunch by going to Pantai Beach to check out the Zen Zone. 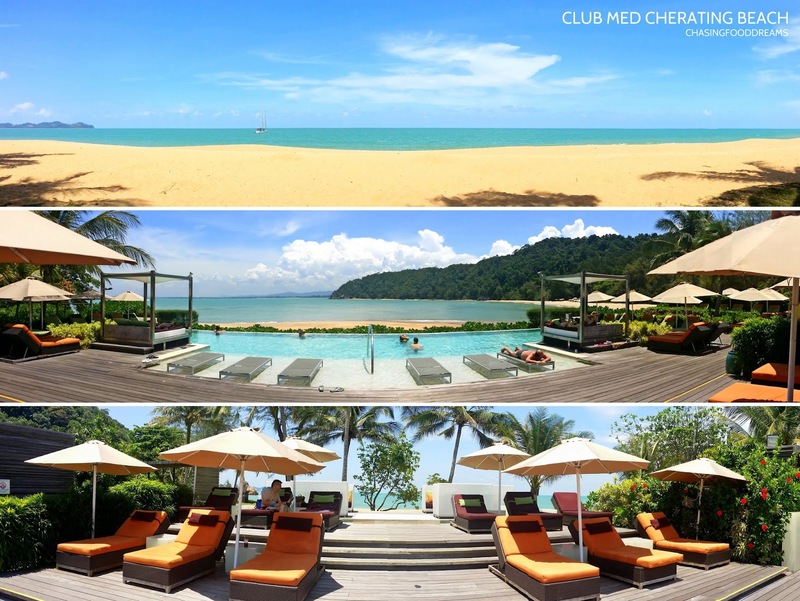 There is a train that departs every 30 minutes from Club Med to Pantai Beach. An eco-friendly train, it runs on biodiesel. The ride was less than 10 minutes. When we arrived at Pantai Beach, it was pure bliss! Blue skies with cotton clouds in sight meets sea green water at the horizon. Acres of sandy beach stretches along the coastline with coconut trees spread all over the edges of soil and sand. A light breeze completed the near picture perfect scene. I wanted to capture this moment in my memory forever. There was barely any one on the beach as it was still pretty hot in the early afternoon. We strolled around and took photos, then we walked further into the Zen Zone. The Zen Zone is dedicated to create a tranquil environment for individuals and couples seeking a relaxing and zen moment. We passed The Rembulan restaurant and was admiring the beautiful scenery that day. As soon as we reach the Zen pool area, we saw lots of bright colored lounge deck chairs place in rows with some in the sun and some shaded. There were light juices served at the bar to quench your thirst too. 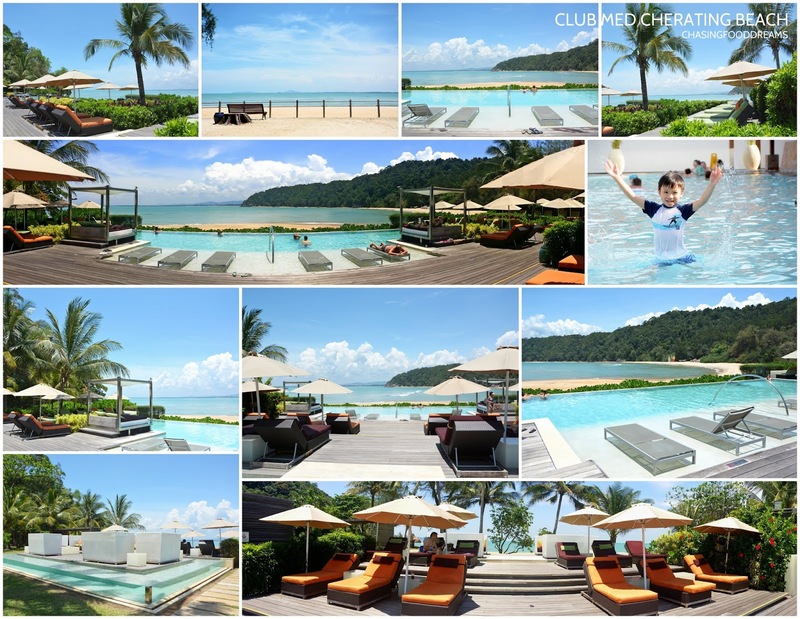 There is full facility of shower and changing rooms at the pool. Time to head back though I was hesitant about leaving this piece of heaven. 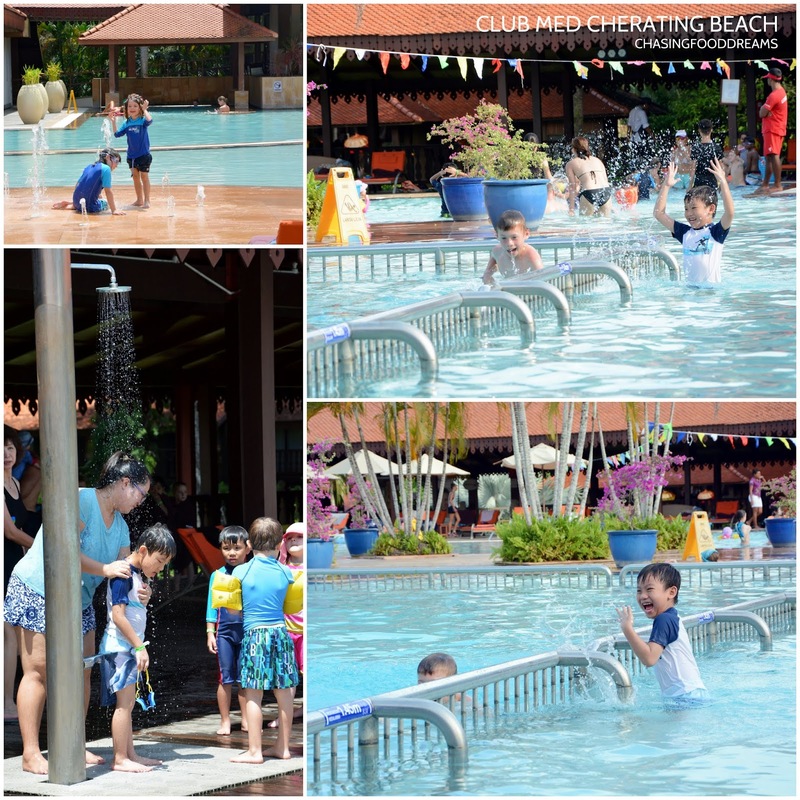 Back at Club Med, I took a quick peek at D and spotted him in the splash pool area with other kids having lots of fun. 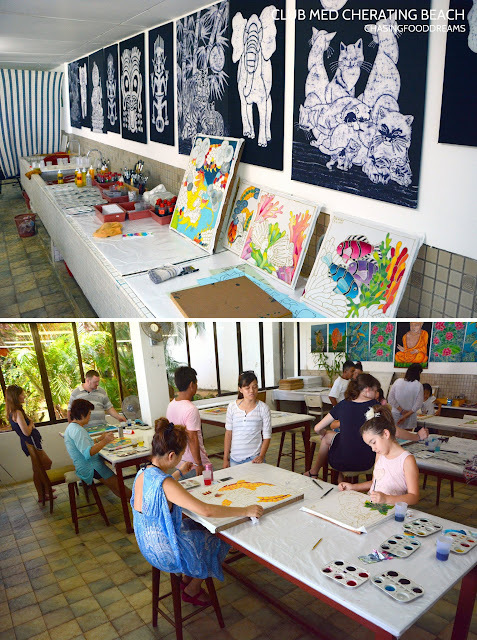 We were told that the kids will be having their tea break soon and then they will be practicing after as they are going to put on a performance of parents later..
We stroll by a room which had a few guests working on Batik Painting and Tie-Dye T-shirts. It’s good for relaxation and I wish I had time to do one myself. We also passed the gym and Club Med Passworld®, a modern space dedicated to teens. Then it was time to catch the performances by the children at the Amphitheatre. Babies to children, it was shows after shows of the little darlings performing some act. We retreated to the room for a quick rest and change before heading to dinner at The Mutiara. After dinner, we headed back to the Amphitheatre to catch the night performances by the G.Os. We caught two night shows, one themed Beetlejuice and the other themed The Wizard of Oz. My little one enjoyed the Wizard of Oz with all its circus theatrical act. On Saturday evening, after the night performance, JB and the G.Os lead all of us to the open garden space for an open house party filled with lots of drinks, dance, fun and even fireworks! A lot were also seen hanging out by the bar for giggle juices! It was an evening to remember. We had a great family time that night as we could all hang out together and just have some fun. The next day, we got up fairly early and head on for a quick breakfast before following the tour to the Turtle Sanctuary just right outside Club Med. 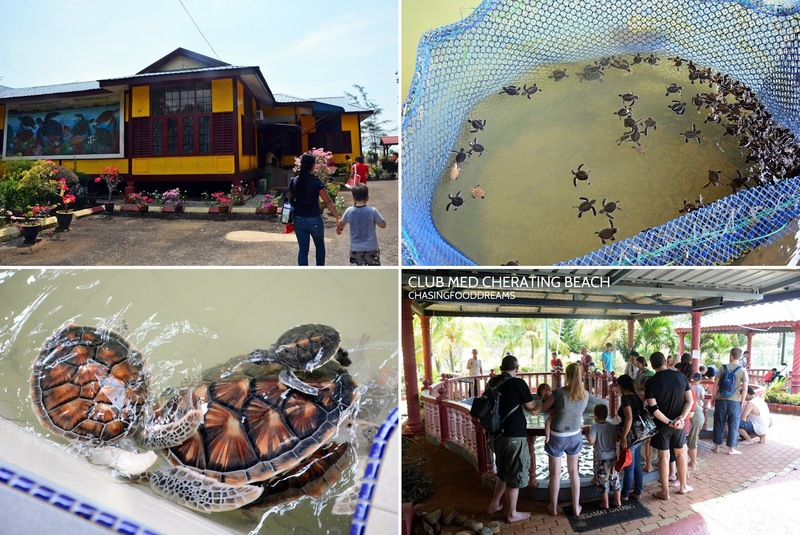 The Turtle Sanctuary is quite small but my little one still had a good time checking out the turtles. We headed back and went out to enjoy the swimming pool again for a bit before it was time to pack up and leave Club Med. 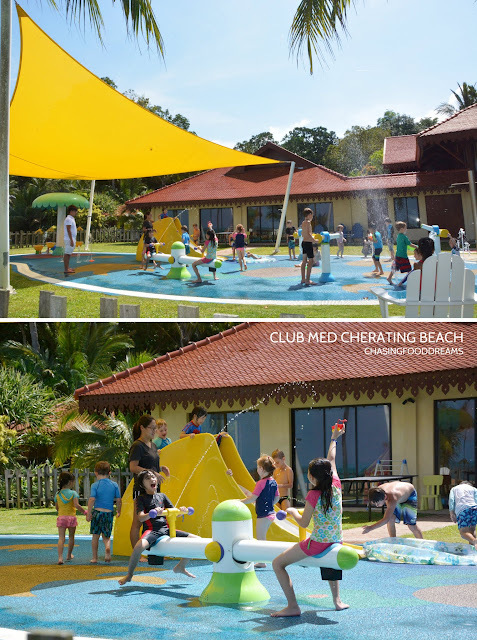 At Club Med Cherating Beach, whether you choose to take up and enjoy all the activities they offer or simply put up your feet and do nothing but soak up the beautiful ambience with relaxation, it is a great vacation for the family. I get to spend time with my little one and yet I get to have some adult time with my other half. 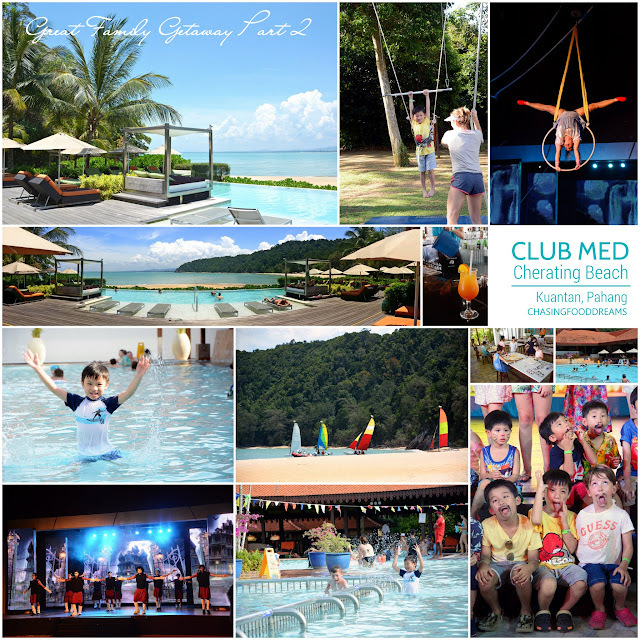 My little one enjoyed the stay so much so that he has been asking me when we will be returning to Club Med. My other half enjoyed the food and relaxation as well and is now thinking to bring back his mom together with us to Club Med. G.O Olivia from Taiwan sent us off that afternoon. It may be a short stay at Club Med but we left feeling really relax and wonderful that afternoon. It’s amazing how such a short and sweet vacation can yield such satisfaction for me and my family. 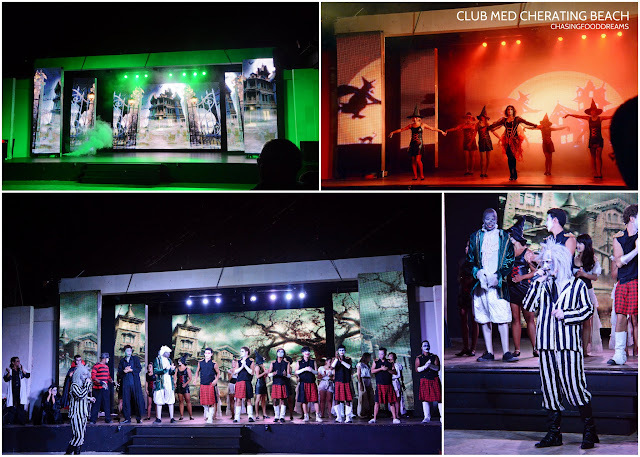 This Club Med trip had really gotten me so excited that I can’t wait to visit other Club Meds in the world! Visit www.clubmed.com.my or www.facebook.com/clubmedmalaysia, or call 03-20531888 (9am-8pm, Mon-Sat including public holidays) for more information.